In order to help describe the character of our esteemed Dude, Dudeist writers often use examples from the animal kingdom which exhibit traits of calmness, relaxation, and a generally easygoing attitude. Art Schaub has discussed the great marmot/ferret divide, the desert tortoise, and other animals, Ben Ranfeld from Lebowski Podcast has compared dolphins with the Dude, and several of our forum have celebrated the sloth. The Dudely Lama, Oliver Benjamin has enjoyed an unusual intimacy with the Asian elephant due to his day job as a Thailand-based journalist (Asian Geographic Magazine, Lexus Magazine), and personally considers the Asian elephant to be the king of the Animal kingdom when it comes to dudeliness. 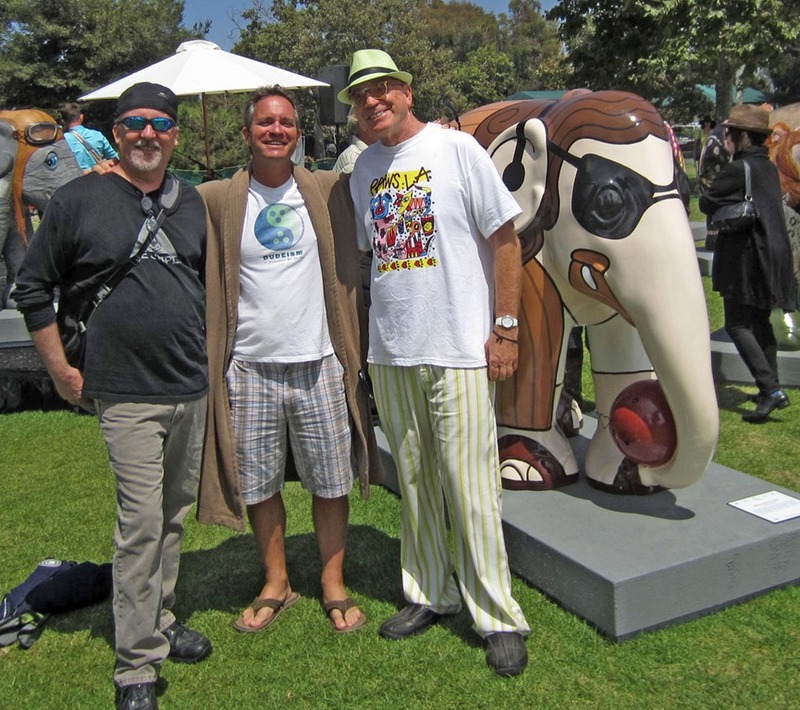 As a result of his involvement with elephants, he has been invited to participate in a far out event in Dana Point, California to help raise money for the endangered, and very dudelike mammal, man. The Elephant Parade is an event held in cities around the world to help raise money to support conservation of the Asian elephant. Life-size baby elephant sculptures are painted by professional and famous (and not so professional or famous) artists and auctioned off. Proceeds go to elephant charities via The Asian Elephant Foundation, the Elephant Parade’s non-profit wing. Events so far have taken place in England, The Netherlands, Luxembourg, Belgium, Denmark, Italy and Singapore. This is the first in a series of Elephant Parades which will be located in the U.S. 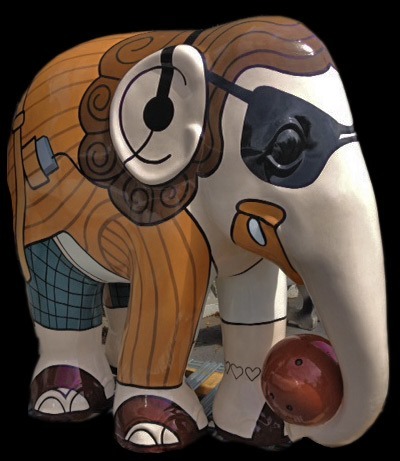 The Mellowphant will join about 40 other elephants, painted by luminaries such as Cesar Millan, Lily Tomlin, Olivia DeBerardinis, Khloe Kardashian and several others. They will be exhibited for three months before being auctioned off in November. The Dudely Lama will be in attendance for the kickoff next Saturday, August 24, from 12pm-6pm. 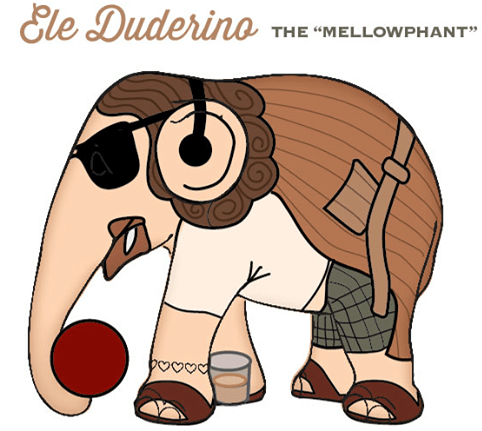 If you’re in the neighborhood, come on down and hang out in front of Ele Duderino. There’s also a possibility as well that the hosts of the event, Dana Point resorts will provide resources to throw a Dudeist event at some point later on during the three month exhibition. Epilogue (added 8/25): The event was awesome! Got to hang out with Rev. Mark Walter who founded the Dudeist Monastery of Nothingness, and discovered that Andre Miripolsky, one of the other 36 artists is a devout Dudeist Priest. Also, chatted with Cesar Millan, who is a very Dudely fella, despite his superstar status. Looking forward to the US Tour. Just visited Dana Point and took some pics with the mellowphant. Very nice.